Gimonnet is a grower Champagne house with 69 acres, more vineyard acreage in the Côte des Blancs than any of the larger producers. The Gimmonets have many old-vine parcels in some of the regions most exceptional grands crus, but the house makes no Champagnes that meet grand cru regulations. Instead, they chose to blend from different sites in order to craft their desired style. All of the reserve wines used for their NV champagnes are housed in bottles, rather than the more common practice of keeping reserve wines in tanks. 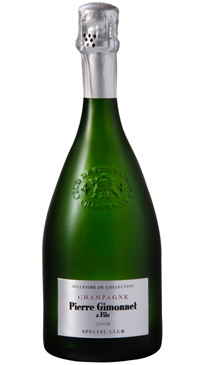 This is a full bodied, complex and elegant Blanc de Blancs. Aged on the lees for more than the minimum requirements and utilizing very little dosage- just 5g/L. The assembly is composed exclusively of Chardonnay and the cuvee confers complexity and longevity. This is a Champagne of superb structure, offering a very beautiful body, with elegance and finesse. The best-value sparkling wine of any kind that I have tasted in the past five years. In all its raw, youthful innocence, this is the epitome of introverted, tightly coiled restraint. A beguiling transparency of pure acid drive propels an incredible finish that splashes long and strong with breathtaking, scintillating, crystalline minerality. This is a cuvee of effortless poise and boundless energy. -97 points, Tyson Stelzer for Decanter Magazine.